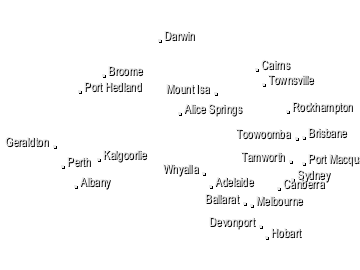 Geraldton Weather Watch radar has good coverage in all directions. Intense thunderstorm or cold fronts can be seen up to 250 kilometres away, however at this distance the radar is sensing the upper structure of the system and may give an incorrect approximation of the actual surface rainfall intensity of the system. The radar is susceptible to anomalous propagation (AP) for distances up to 80 kilometres along the coastline and seaward of it. 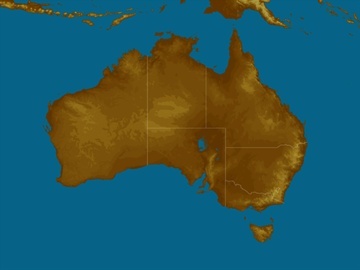 The AP appears as an area of low intensity echoes usually around the Abrolhos Islands (the Abrolhos Islands group stretches from a position approximately 80 kilometres west of Geraldton running north-west, roughly parallel to the coast, for approximately 80 kilometres). Heavy rain directly over the radar site can cause attenuation of all signals. Path attenuation can also occur when the radar beam passes through intense rainfall, with the returned signals from cells further along that path reduced.